Okay, now that the St.Patrick’s Day festivities are over, it’s time to scoop up on the Mega Sale Corned Beef Brisket in the supermarkets. Corned Beef and Cabbage is one of my favorite meals. To me, the world comes down to two kinds of people; there are those who love cabbage and those who wish they did. This recipe is a shout out to those who love firm sour cabbage draped over the salty sensuous rush of corned beef … pssst: The secret ingredients are one stick of butter and one bottle of dark beer. Preheat Oven to 450 degrees Farenheit. Yep. That’s hot. 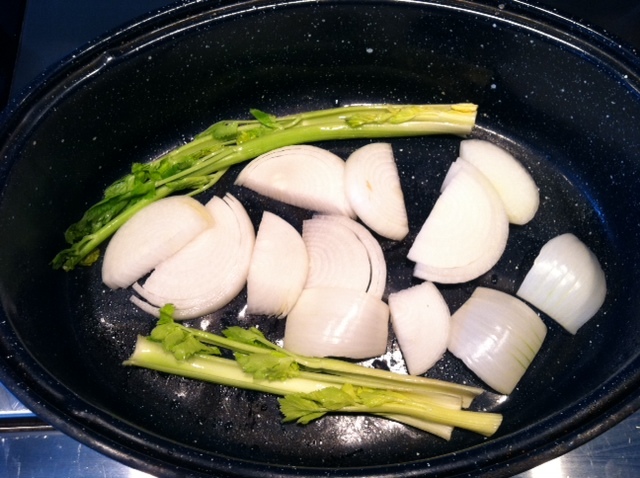 Begin with a dutch oven, place sliced onions and celery at bottom and spread out so corned beef brisket can sit on top of veggies fat side up. Empty seasoning packets and one bottle of dark beer into the dutch oven. 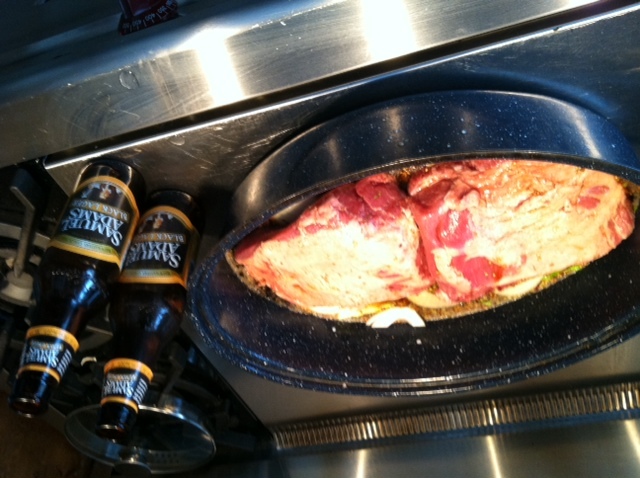 Now, we are going to pressure cook this brisket. 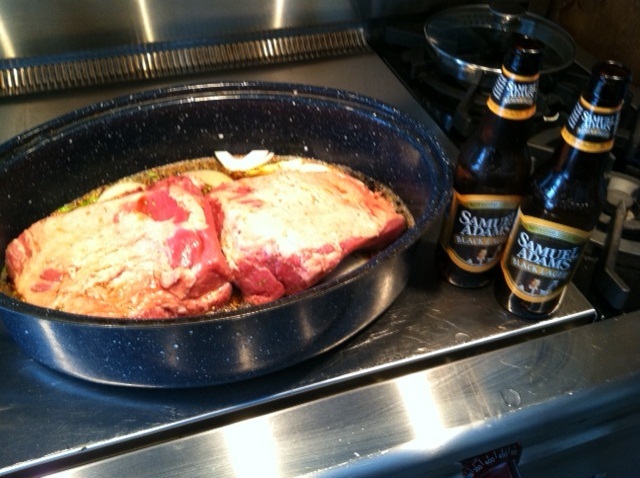 Place tin foil over roast and concave it down not touching beer or veggies, but close. 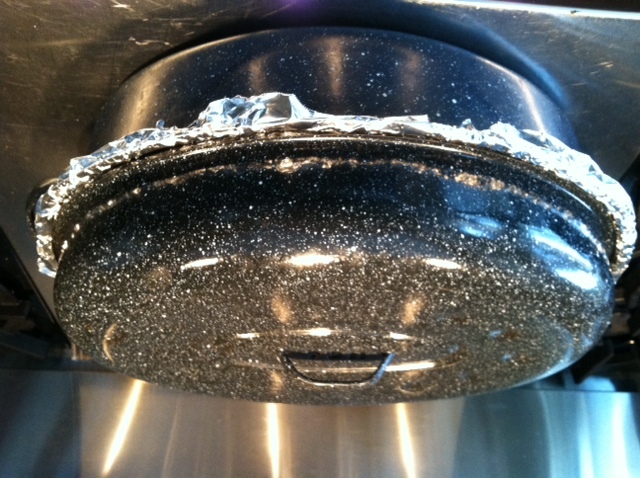 Seal it around and place dutch oven lid on top. On my dutch oven it takes two sheets to cover the width. Sour Cream–about 1 cup—2-3 tsp of horseradish root—5 dashes of worsteshire suace, salt, pepper, a tsp of dijon mustard with a final dash of lemon juice. I stir this up and refrigerate until dinner. Sorry I forgot to take the money shot, but it smelled so good I was pleasantly distracted and very satisfied. ‘Tis a good day with Drunken Corned Beef and Cabbage.